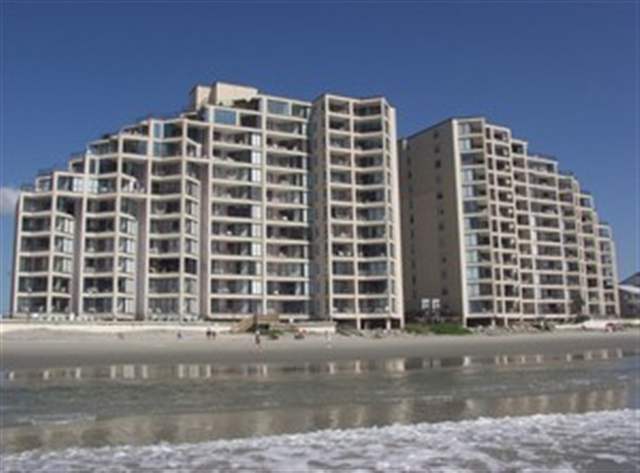 The two, 12-story towers of Surfmaster by the Sea, both of which feature a unique, tapered architecture, are mirror images of one another, thereby providing a beautiful and easily recognizable focal point along the white sand beaches of Garden City Beach. The Garden City Beach location is ideal, as it is situated on North Waccamaw Drive, just eight miles south of Myrtle Beach and less than two miles from the Garden City Pier and Surfside Beach. All of Myrtle Beach’s popular attractions are just minutes from this prime, Garden City Beach location! Read more about Surfmaster real estate. Surfmaster by the Sea features one, two and three bedroom condominiums, each boasting a private, oceanfront balcony which offers fantastic views of the white sand beaches and rolling surf below. The balconies of the one-bedroom condo units are accessed from the living room, while the balconies of the two and three-bedroom condo units are accessed from both the living room and the master bedroom. One-bedroom units are 890 square feet in size, two-bedroom units are 1,250 square feet in size and three-bedroom units are 1,570 square feet in size. For the ultimate in beachfront living, Surfmaster also features spacious, three-bedroom penthouse units which boast private balconies which encircle the entire living area. Imagine the spectacular, panoramic views afforded by these prime pieces of real estate!